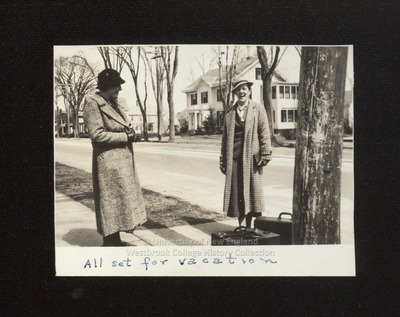 Two Westbrook Junior College students stand beside suitcases on Stevens Avenue in this 1936 sepia toned candid snapshot with "All set for vacation" written in blue ink on the front. On the back, in blue ink, is written "Moore & Cole, spring vacation." The two girls wear dress coats and felt hats with leather gloves and clutch purses. They smile. Though the trees are bare of leaves and the girls are dressed for cold weather, there is no snow on the barren ground.